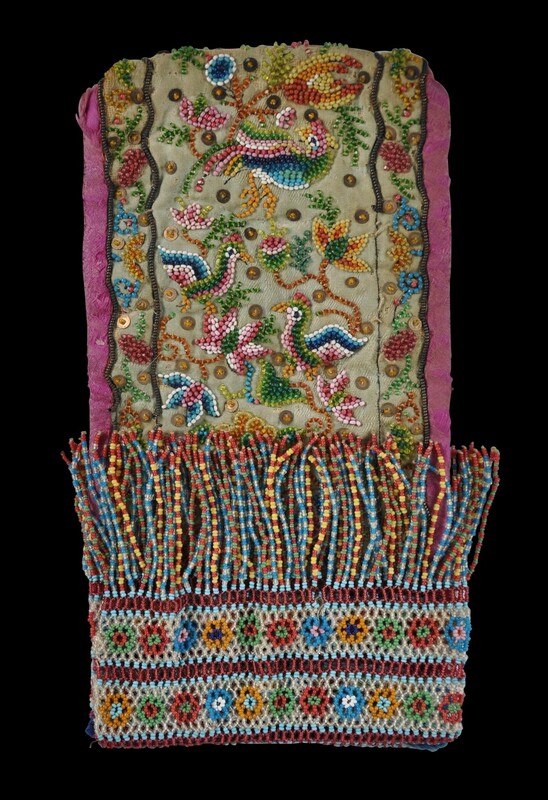 This elaborate, unusual and very fine pouch or bag of green and pink damask silk is decorated on both sides with colourful glass rocaille beads showing birds, flowers and finger citrons. Small metal spangles also have been used in the decoration. The opening has a double layer of beaded netting decorated with flowers, and long beaded tassels on both sides too. The beadwork is of exceptional quality. Phoenixes and other birds and other auspicious motifs have been employed in the designs. The pouch is in very good condition with losses only to some of the peripheral beading. There is a small tear to the beaded netting near the opening of the pouch to one side but this is obscured by the overall profusion of netting and tassels. Overall, a fine and unusual piece.